On July 19, 2017, our second pup of the year was tagged RJ36 (born to RK30) at his natal birth site along a stretch of Napali Coast. But he wasn’t officially re-sighted again until late in the afternoon last week Tuesday when a field biologist at Pacific Missile Range Facility reported two seals had hauled out along Kauai’s southwestern shore. One was R8HY and the other turned out to be RJ36. The field biologist observed some unusual scars just forward of the weaner’s left fore flipper and across his dorsal above his rear flippers. After reviewing photos of RJ36 with the Hawaiian Monk Seal Research Program (HMSRP), the consensus is RJ36 had an encounter with a shark. The good news is RJ36 appears to be in good health. His wounds have healed, and he’s looking nice and plump. In the Main Hawaiian Islands, HMSRP does not rank sharks as a major threat to monk seal survival. According to HMSRP, there have been no documented cases of mortality from sharks in the Main Hawaiian Islands. However, that doesn’t mean they haven’t happened, as those events probably go completely undetected. RJ36 isn’t Kauai’s only known seal with suspected shark encounters. There’s also RJ36’s mom, RK30, who was first sighted as an adult by the HMSRP in 2005, already with what’s possibly a scar from a shark bite. She also has a dozen or more cookie cutter shark scars dotting her body. More recently, another mature female RK13 was sighted in 2011 with two apparent shark wounds–one above her left fore flipper and the other on her right ventral side. We reported on it here. She was regularly sighted along Kapaa’s canals as she recovered from her injuries. She was also pregnant at the time but eventually gave birth to a healthy pup, RL10. Then, in May of this year, we reported here that RK13 was sighted with an unsightly wound to her nares (nostrils), possibly due to a shark bite. Monk seals have an amazing ability to heal themselves through a process called “tissue granulation,” and RK13’s wound healed nicely. There are two other known seals with shark wounds. RH92 was a newly weaned pup in 2016 when she turned up with a fresh and deep cookie cutter shark wound on her head. R1KY has a large shark bite scar below her right fore flipper, most visible on her dorsal side. Cookiecutter: The cookiecutter shark, also called the cigar shark, lives in warm, oceanic waters worldwide and particularly near islands. Its common name comes from the cookie cutter-like wounds it leaves in its prey. It lives at depths of 3,200 feet during the day but migrates up the water column at night to feed. To feed, the fish uses its suction cup-like lips to attach itself onto prey. Then, it spins its body, using the row of serrated teeth on its lower jaw to remove a plug of flesh, leaving behind crater-like wounds that are two inches across and approximately two-and-a-half inches deep. Galapagos: This shark grows to 10 feet in length and generally eats bottom fishes and cephalopods. In the Northwestern Hawaiian Islands, where approximately 85 percent of the Hawaiian monk seal species lives, Galapagos sharks have been recorded predating on monk seal pups in nearshore waters around French Frigate Shoals. It’s hypothesized that a small group of sharks are involved in this behavior. You can read more about this unusual mortality event and mitigation efforts here. Not all appearances of sharks spell trouble for monk seals, as this video from National Geographic’s CritterCam shows. At 1:50, you’ll see sharks in the foreground but no interaction between the species. And at 4:42, you’ll see the Crittercam-toting monk seal chase off a couple reef sharks. March Seal Deaths: Two seals were lost in March. On Kaua`i, RG13 a yearling female, was found dead in the Lihi Canal in Kapa`a. Also, RT12, born on Kauai, a 6-year old male that had been living on O‘ahu was found washed up dead. Carcasses were collected and investigated by law enforcement and biologists, and then thoroughly examined by marine mammal veterinarians . Tissues were sent for further investigation for cause of death, as nothing was found on gross necropsy. Both RG13 and RT12 were seen healthy and behaving normally days before death, and they were in good body condition. Each necropsy indicated acute death and histopathology results provided no indication of disease or injury. Inconclusive results such as these are challenging, however one likely cause that is of great concern is acute death by entrapment underwater causing wet, not dry drowning. Seal of Behavioral Concern, R1KY: Mid April, a young adult female R1KY, originally from Ni’ihau and primarily sighted at Salt Ponds and Poipu, suddenly started to swim with snorkelers and the many swimmers at Poipu county beach park. Previously she was very social with other seals of varying ages. With no seals around, she began following swimmers in the water and onto shore with an avid and unsafe interest for her and the public. R1YK’s behavior could escalate into “seal play” or mating behavior of biting and holding people down in the water. NOAA and DLNR coordinators, researchers, and managers have been in discussions and have implemented a plan. If you see R1KY (she has a bleach mark on her back “V01” and also a red tag on the left rear flipper 1KY) appear between Sheraton and Brennekes beach, please report her to the hotline (808-651- 7668) . Remember! If a seal is swimming among people DO NOT call people out of the water or bring attention to the seal, as this may cause panic and a possible drowning. 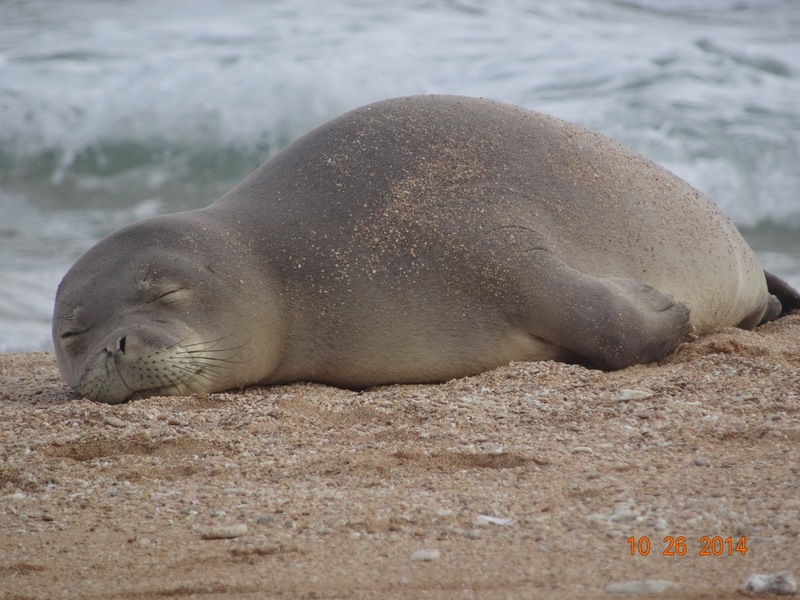 Grand sightings total: 2​,516 monk seal sightings on Kauai in 2014! (6.9 seals per day). Kauai population: 47 unique individual seals sighted in 2014. ​5 seal pups born (3 male and 2 female). 3 pregnant females likely pupped on Niihau (departed pregnant, returned thin). New Seals: we sighted 11 new seals in 2014, likely from Niihau. 4 were flipper tagged​​ (R4DD, R8HE, R8HP, R1KY). ​1 was captured for ​surgical removal of an injured eye (R1KU)​ and eventually released on Niihau​. ​3 were ​bleach marked for temporary identification. The largest and strongest pup of the year is female RF30. Based on her excellent body condition, it is obvious that she quickly learned to forage on her own after weaning. She was routinely sighted during the final few months of 2014 along the east side of Kauai.